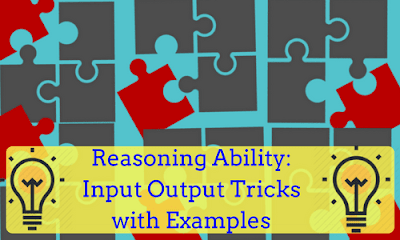 Input and Output is an important section in Bank PO/SO exams. It covers 5 to 7 marks in the reasoning section. But most of the candidates, try to avoid this section as it is time consuming and tricky. So, today we have provided you the different types of sequences present in this section. And, step-4 is the last step for this input. Now, find out an appropriate step in each of the following questions following the above rule. As I have mentioned earlier, the 1st step in solving such problems, is to determine the pattern. For pattern determination, always observe the Input and the Last step. If we observe the last step carefully, we find that the words are written in alternative forward/reverse alphabetical order. The alphabetical order of these words as per the dictionary is - are, brought, enough, gone, station, take. In the steps, the word which comes alphabetically last in position is shifted in the 1st position and the remaining words are shifted right. Then, the word which comes alphabetically first in position is shifted to the 2nd position and the remaining words are shifted right and so on, till the desired pattern is obtained. We can make use of this technique to determine the pattern (or)we can number each word and follow the number pattern to determine the answers. Ques 1 INPUT: car on star quick demand fat. What will be the third step for this input? A number sorting machine when given an input if numbers, rearranges them in a particular manner step-by-step as indicated below till all the numbers are arranged. Given below is an illustration of this arrangement. Answer: STEP-6 is the last step for this input. The last step indicates that the numbers are arranged in an ascending order. In the 1st step , the smallest number is placed in the first position and the remaining numbers are shifted. In the 2nd step, the largest number is placed in the last position and the remaining numbers are shifted. So, alternatively the numbers are arranged in ascending position and if the number is already present in the desired position, then it is left un-shifted. Ans) Since the numbers can be arranged in any possible way, it is not possible to determine any of the previous steps. If we observe the last step, we can find that the numbers are arranged in ascending order and the alphabets are written in reverse dictionary order. Basically, we don’t have to draw arrows every time , but we can observe that the numbers and alphabets are arranged in an alternative steps. First, the number is arranged in ascending order and then the alphabet is arranged in reverse alphabetical order and the remaining words/numbers are shifted. Directions: A word and number arrangement machine when given as input line of words and numbers rearranges them following a particular rule. The following is an illustration of input and rearrangement. Step-5 is the last step of the rearrangement for the above input. We can observe in the last step that the alphabets are arranged in alphabetical order but the numbers are not in ascending/descending order. The numbers are related to the words preceding them. Each word is succeeded by a number and both the word and the number are arranged simultaneously and the remaining words/numbers are shifted like the above problems. Similarly, if the word preceding the number has odd number of letters, then the number is obtained by adding 3 to the number of letters. Direction: Analyse the following input ans answer the questions that follow. Ques 1. For the above input, what will be the position of 12 in step-3? Ques 2. How many steps are needed to complete the arrangement ? Ques 3. Which of the following is 6th from the left in step 3? Directions: A word arrangement machine when given an input of words rearranges them following a particular rule. The following is an illustration of input and rearrangement. What would be the last step of the arrangement. Answer: Step-5 is the last step. From the given consonant, the dictionary order of the letters are - d,h,k,s,y,z. In each step, the vowels and consonants are arranged in their desired position simultaneously. Read the following input and answers the questions that follow. Ques 1. Which of the following will be the last step of the rearrangement? Ques 2. In step 4, which of the following words would be at 6th position from the right? Ques 3. Which of the following is step-3 of the rearrangement? Ques 4. In step-4 of the rearrangement, if ‘dip’ is related to ‘axe’ and ‘knife’ is related to ‘harm’ in a certain way, which of the following would ‘axe’ be related to, following the same pattern ? Ques 5. Following pairs follow a certain relationship in step-4 and step-5. First element of the pair is from step-4 and second element is from step-5.Which of the following pairs is different from the others?